270 pages | 54 B/W Illus. The Global Financial Crisis has reshuffled the cards for central banks throughout the world. In the wake of the biggest crisis since the Great Depression, this volume traces the evolution of modern central banking over the last fifty years. It takes in the inflationary chaos of the 1970s and the monetarist experiments of the 1980s, eventually leading to the New Monetary Consensus, which took shape in the 1990s and prevailed until 2007. The book then goes on to review the limitations placed on monetary policy in the aftermath of the global meltdown, arguing that the financial crisis has shaken the new monetary consensus. In the aftermath of the worst crisis since the Great Depression, the book investigates the nature of present and future monetary policy. Is the Taylor rule still a satisfactory monetary precept for central bankers? Has the New Monetary Consensus been shaken by the Global Financial Crisis? What are the fundamental issues raised by the latter cataclysmic chain of events? How should central banks conceptualize monetary policy anew in a post-crisis scenario? Existing books have dwelt extensively on the characteristics of the New Monetary Consensus, but few have cast light on its relevance in a post-crisis scenario. This book seeks to fill this gap, drawing on the lessons from five decades of contrasted theoretical approaches ranging from Keynesianism, monetarism, new classical macroeconomics, inflation targeting and more recently, pragmatic global crisis management. 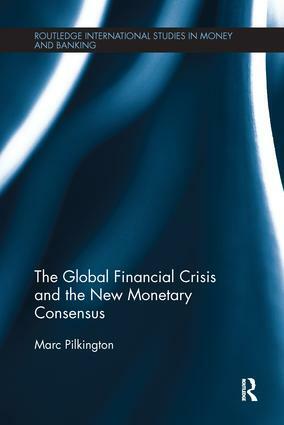 Marc Pilkington is Associate Professor of Economics at the University of Burgundy, France.